My mother scored the second highest score in the newly formed WAVES, and they put her in Naval Intelligence spying on Russian radio chatter up in Seattle. I am not sure if she meant the whole Navy. Trump never served. “Perhaps Intelligence should go back to school,” Mr. Trump said. Today, our allies are looking at our President as being a worse threat to their national security then Putin for what he did to our Armed Forces. Most of them want the American People to IMPEACH the Mad Hotel Mogul who thought he was King of the World due to his Trump hotel chain. Pushing little people about, was a joy to him. Now he pushes around those in charge of defending our Nation. Trump is weakening us, and our NATO allies. Putin is thrilled. Trump is giving aide to our enemy. There is some indication I am being examined in cyber-space. Buster Howe has Ian Easton’s old job, which appears to employ American citizens in the defense of the British Empire. 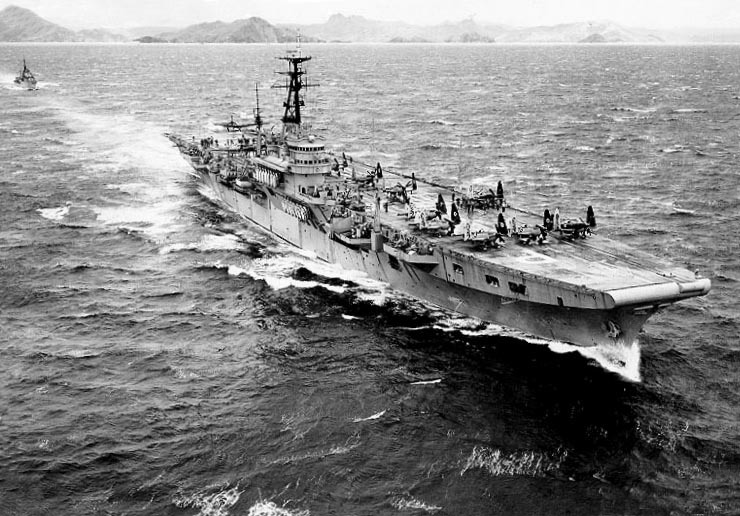 Sir Easton captained the aircraft carrier in photo above. Rena has not come forth. Is she being employed by the Queen in some manner – who is surrounded by beautiful women ready to defend Her Majesty and Britannia. Rena must own dual citizenship. I believe Easton helped design the cote of arms seen above. I have an e-mail from Rena’s schoolmate admonishing me for turning Rena into a goddess. Imagine if there was no Art. What would cyber-space look like. I have found my beloved Muse. 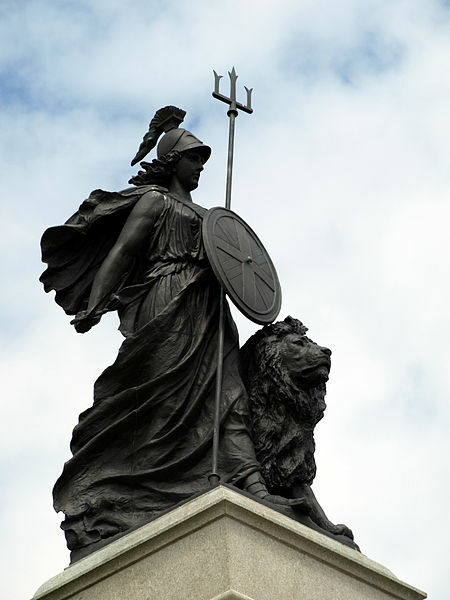 They call her Britannia. Got you – beautiful! How many pedestals have you stood on? The British Defence Staff – US is led by the Defence Attaché and has responsibility for military and civilian MOD personnel located both within the Embassy and in 34 states across the USA. Early portraits of the goddess depict Britannia as a beautiful young woman, wearing the helmet of a centurion, and wrapped in a white garment with her right breast exposed. She is usually shown seated on a rock, holding a spear, and with a spiked shield propped beside her. Sometimes she holds a standard and leans on the shield. On another range of coinage, she is seated on a globe above waves: Britain at the edge of the (known) world. As Defence Attaché at the British Embassy in Washington, Major General Buster Howes OBE is focused on operations and contingency planning, defence intelligence, cyber and space, service personnel, defence education and doctrine. 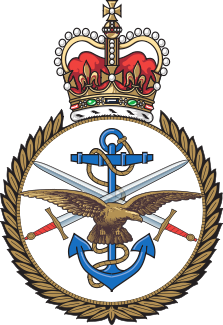 “To prepare senior officers and officials of the United Kingdom and other countries and future leaders from the private and public sectors for high responsibilities in their respective organisations, by developing their analytical powers, knowledge of defence and international security, and strategic vision”. RCDS forms a part of the Defence Academy of the United Kingdom. In fulfilment of its mission, the college runs one course a year, from September to July. Each course is attended by a maximum of 90 full-time members, around one-third from UK and two-thirds from overseas. Attendees are military officers of Colonel/Brigadier or equivalent rank but also include civil servants, diplomats, police officers and representatives from the private sector. All have been selected to attend the course on the strength of their potential to progress to a high position within their profession. The course composition has been progressively widened to include members from over 40 different countries. Since 2001, course members have to option to study in a joint programme that leads to a MA in International Security and Strategy from the King’s College London. 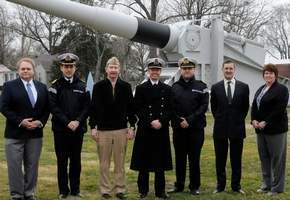 Navy officials briefed a group of British Naval officers on key U.S. Navy technological programs and the potential for new science and technology collaboration during a tour here Feb. 13. U.K. Royal Navy Commodore Alex Burton led the delegation of British officers who toured Naval Surface Warfare Center Dahlgren Division (NSWCDD) laboratories and test sites for overviews on programs ranging from directed energy weapons and the Littoral Combat Ship Gun Mission Module to the Electromagnetic Railgun and the Potomac River Test Range. In 1922 a cabinet committee under Winston Churchill, then Secretary of State for the Colonies, recommended the formation of the College. The college was founded in 1927 as the Imperial Defence College and was located at 9 Buckingham Gate until 1939. Its objective at that time was the defence of the Empire. In 1946, following the end of World War II, the college reopened at Seaford House, Belgrave Square and members of the United States forces started attending courses. It was renamed the Royal College of Defence Studies in 1970 and in 2007 the Queen and Prince Philip visited the college. 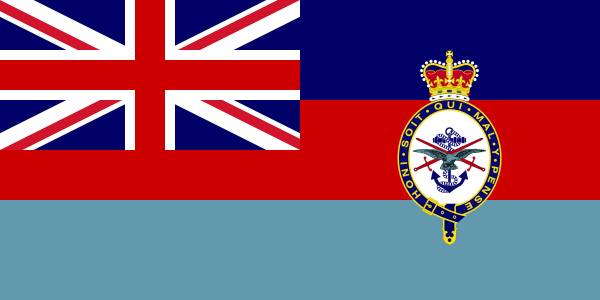 The British Defence Staff – US, which was previously known as British Defence Staff (Washington), is the home of the Ministry of Defence (United Kingdom) in the United States of America and its purpose is to serve the interests of Her Majesty’s Government in the USA. The British Defence Staff – US is led by the Defence Attaché and has responsibility for military and civilian MOD personnel located both within the Embassy and in 34 states across the USA. British Defence Staff – US alongside the Foreign and Commonwealth Office and other Government Departments collectively serve the interests of Her Majesty’s Government in the USA. The British Defence Staff in the United States is led by the Defence Attaché Major-General Francis Hedley Robertson “Buster” Howes, CB, OBE. The Defence Attaché is the British Ambassador’s senior adviser on defence issues, and as Head of the British Defence Staff in the United States has responsibility over 385 military and civilian MOD personnel located both within the Embassy and in 34 states across the USA. The Defence Attaché is drawn rotationally from each of the three Services. Buster was educated at Christ’s Hospital and York and London Universities and was commissioned into the Royal Marines in 1982. He initially served as a troop commander in 42 Commando RM, deploying for the first time on operations in Northern Ireland. After training a recruit troop, he qualified as a Mountain Leader and was then posted to Recce Troop, 45 Commando RM. Following a stint as AdC to Major General Training of Reserve and Special Forces RM, he was appointed to the 2nd Division, USMC, as a Regimental Operations Officer (for the First Gulf War). He subsequently commanded Charlie Company, 40 Commando RM; Commando Training Wing at CTCRM; 42 Commando RM (for the Second Gulf War); and 3 Commando Brigade. Buster has worked in personnel policy in the Fleet HQ as well as having been a planner in the Rapid Reaction Force Operations Staff of UNPROFOR in Bosnia and a strategist in the Naval Staff Directorate in MOD. He has attended the Naval Staff College, the Higher Command and Staff Course, the Royal College of Defence Studies, and the Pinnacle Course. Additionally, he has served as a Divisional Director for ICSC(L) at the JSCSC and as COS to Commander Amphibious Forces (CAF). He was Chief Joint Co-ordination and Effects in HQ ISAD X in Kabul, followed by a post as Director Naval Staff, in 2007. He served as Head of Overseas Operations in MOD before being appointed Commandant General Royal Marines/CAF in February 2010. For 15 months up to 1 August, Buster Howes commanded Operation ATLANTA, the EU Counter Piracy Mission in the Indian Ocean. Captain of Deal Castle, President of the Royal Marines Mountaineering Club, and Vice President of the RNRM Children’s Charity, Buster has three daughters and his interests range from teaching them table manners and repairing the things they break, to mountaineering, gardening, art and ideas. He recently gave up water skiing. A Defence Attaché is a member of the armed forces who serves in an embassy as a representative of their country’s defence establishment abroad. The Defence Attaché is responsible for bilateral military and defence relations. WASHINGTON — In what is believed to be the first time since the 1940s, the entire British defense staff will be here March 25 to discuss long-range strategy and the impact of budget cuts with their U.S. counterparts, according to U.S. and British sources. Easton joined the Royal Navy in 1931 and qualified as a pilot at the start of World War II in which he saw active service on aircraft carriers. On 4 January 1941, flying a Fairey Fulmar of 803 Squadron from HMS Formidable during a raid on Dakar he force landed, with his aircrewman Naval Airman James Burkey and was taken prisoner and held by the Vichy French at a camp near Timbuktu until released in November 1942. He was appointed Assistant Director of the Tactical and Weapons Policy Division at the Admiralty in 1960 and was seconded to the Royal Australian Navy as Captain of HMAS Watson in 1962. He went on to be Naval Assistant to the Naval Member of the Templer Committee on Rationalisation of Air Power in 1965, Director of Naval Tactical and Weapons Policy Division at the Admiralty in 1966 and Captain of the aircraft carrier HMS Triumph in 1968. After that he was made Assistant Chief of Naval Staff (Policy) in 1969, Flag Officer for the Admiralty Interview Board in 1971 and Head of British Defence Staff and Senior Defence Attaché in Washington D. C. in 1973. He last posting was as Commandant of the Royal College of Defence Studies in 1976: he commissioned armourial bearings for the College which were which were presented during a visit by the Queen in November 1977. He retired in 1978. 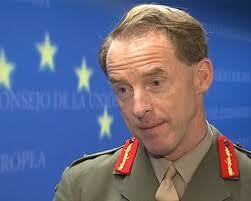 The Commandant of the Royal College of Defence Studies was a UK senior serving military officer between 1972 and 2001. The post rotated through the three branches of the armed forces in turn. 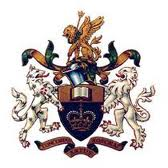 In 1971 the old Imperial Defence College became the Royal College of Defence Studies. In 1991, the post was downgraded to three-star, and then in 2001, it was opened up to competition through public advertisement. Subsequent incumbents have as yet all been senior retired military officers. From the Royal Thames Yacht Club, White Crusader was designed by Ian Howlett and was a traditional 12 metre design evolved from the DeSavery Lionhart ’83 boat of the previous Americas Cup event. However, White Crusader II was a radical design and designed by David Hollam. This second boat was used as a trial horse against White Crusader, but the team eventually decided to use the more conventional designed boat. Tank testing was carried out at Southampton University and HMS Haslar. The deadline for acceptance of challenges was 1 April 1986 and Admiral Sir Ian Easton wrote his own personal cheque for $16,000 as an entry fee deposit. Harold Cudmore acted as skipper-tactician and starting helmsman who then handed over the helm to Chris Law for the remainder of each races. Both boats were originally named simply Crusader One and Two but the “White” part of their names were added when millionaire Graham Walker (Of White Horse whiskey fame) gave heavy sponsorship to the British challengers at the last minute before the event started so the “White” was added to their names. Younger son of Walter Easton, and Janet Elizabeth White-Rickard, of West Mersea, Essex. Married 1st (08.05.1943, Chelsea district, London) Shirley Townend White, WRNS (26.09.1922 – 12.2002) (marriage dissolved) [she remarried (1962) Lt. Merrick Edsell Maslen, RN (1923-1994)], elder daughter of Mr & Mrs Keith Townend White, of Wimbledon Common; one son, one daughter. Married 2nd ((09? ).1962, Kensington district, London) Margarethe Elizabeth Martinette Van Duyn de Sparwoude (marriage dissolved) [she was earlier (1945) married to Ian A. McKenzie Williamson]; one daughter. Married 3rd (09.1987, Isle of Wight) Irene Victoria Christensen; one son, one daughter.